I can't deny that Hurricanger is one of my favorite last decade series. 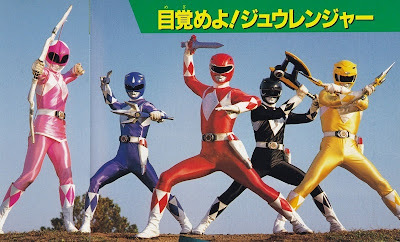 While I do prefer Liveman over it but I prefer it over Kakuranger at the same time. 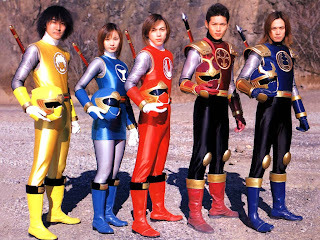 It's time for some throwback to what I believe to be one of the most fun Super Sentai series. Let's get started with the episodes shall we? This episode is a pretty funny one involving Shurikenger and Isshu falling for Nanami due to some love spell. Is it me or am I a sucker for these? I thought Ohranger and Zyuranger made it funny. 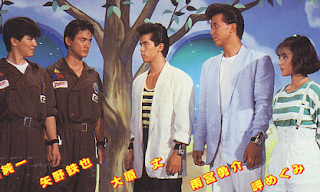 Zyuranger had both Dan and Boi in a temporarily love triangle for Mei and were locked up. 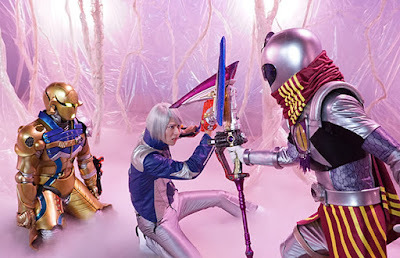 In this episode, Shurikenger having assumed the form of a popular singer fights for Nanami. Isshu reveals that love can also make you strong. IMO, the Isshu/Nanami shipping should have been developed. This week's Kyuranger made me happy that the trip to the past didn't make an easy restoration. Don Armage's still around. He still rules the Universe. The benefit of Don Armage's survival (for some reason) is that we get this really good episode that wraps up Naga's brainwashed and crazy state. 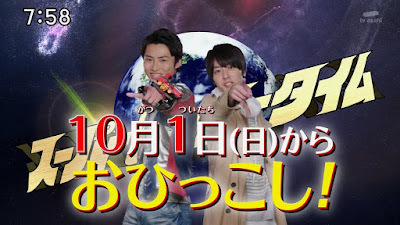 It shows the bond of the Kyurangers with Naga. 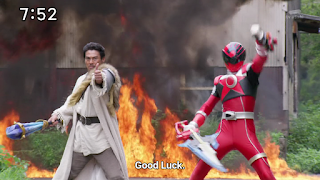 This episode manages to flesh things out between Echidna (who may always be a guest character) and the Kyurangers. Echidna would learn an important lesson in this episode. She sees how Naga may have become better after his redemption. After I've been reading through Them's Fightin' Words, I decided to make my own wishful thinking. 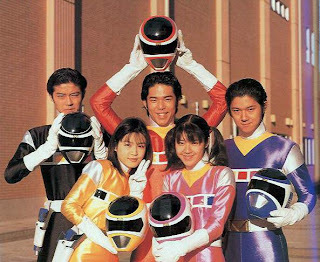 I'm also doing some Hurricanger rewatching right now for my planned top ten favorite Hurricanger posts (which might be canceled anytime soon because of real life issues) which has affected what I wanted to happen. On the other hand, I keep in mind that 2002 and 1988 are 13 years apart so this may not make any sense. 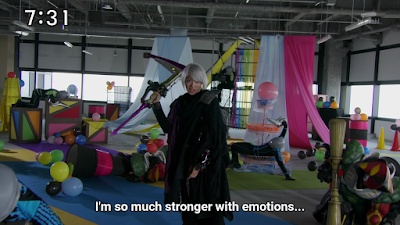 It's time for another weekly Kyuranger review. I'd probably slow things down here for now (or not) depending on how I feel. Anyway, this episode may catch you by surprise or it won't. Lucky's in a desperate situation and Tsurugi is willing to risk his life for Lucky. This also reveals something about Tsurugi's past 300 years ago. So maybe in September 7, 2017 it was the time that Tsurugi was afloat into space and met the Phoenix Kyutama. He was about to die in space but he soon acquired its power to become the first legend against Don Armage. It was interesting to see Tsurugi risk his life and reveal the power of the phoenix within. I was afraid he was going to die in this episode. Fortunately he didn't and I guess that's somewhat predictable for some. Do You Still Feel Your Kiddie Show Sunday Spirit When You Hear The Catchphrase "Super Hero Time"? It's been something that bothers my mind every now and then. Part of me tends to think that I was "too old" for Super Sentai whenever I'm looking at other new school stuff worth checking out. I just think of the "Super Hero Time" sound and I'm somehow taken back to the 90s at least in my mind. But this time, I feel like every time I hear "Super Hero Time" my inner child still wants to shout out loud like I did in the 90s, "IT'S KIDDIE SHOW SUNDAY!" or "Kiddie show Sunday! Kiddie show Sunday!". While I don't do it openly but I still feel like doing it. Okay, that's just gone too far if I still do it right? I mean, what's wrong with being an adult who still watches Super Sentai and Kamen Rider as long as they're responsible citizens? That would be better than teenagers who think they know everything, want to act like they're adults but they are wrecking themselves one way or another. Wishful Thinking: Which Old School Toku Actor Do You Think Should Have Played As Orion In Kyuranger? I'm fine with Kyuranger and all but as always, I just love to nitpick on just anything. Come on, I've already wished for something like Megumi Mori should have been Oboro in Hurricanger or that Kazunori Inaba should have guest-starred as Takeru's father in Shinkenger for obvious reasons. Now let's get straight to business to who I felt should have played as Orion. First it's Kenji Ohba. 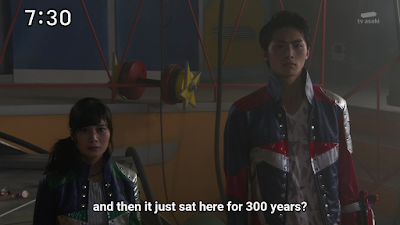 Granted, the Kyurangers didn't meet Retsu Ichijouji in Space 18 so I don't see any reason why it could cause confusion. I think it should be a dream come true for the Kyurangers and more importantly 32-year old Keisuke Minami to run into Ohba himself. 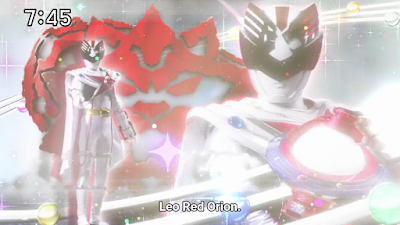 Ohba as Orion could have been a good thing. This week's episode continues with last week. The Argo gets destroyed in the present because of what happened in the past. As the other heroes traveled 300 years ago, the timeline shifted. Boy, is it me or is time travel truly a dangerous thing? Try watching Timeranger and Kamen Rider Den-O (or any time-traveling themed show) if you haven't when you have the time. Yes, Lucky finds out that they are attacked. Just who did it? It's not a pretty sight and if this doesn't change, the Kyurangers will go extinct. A man named Orion appears and connects with everyone. This is the first time Orion shows up to at least some of our heroes. Lucky does show some cool out-of-suit scenes. Takumi Kizu is able to pull it off. While I certainly feel Reiko Chiba's acting is so-so considered her having no prior experience in the theater but I thought this was one cool episode. The nightmare fuel involved with Bandora trying to eat children as apples makes her real nightmare fuel. It did make sense for Bandora (in some way but she lacks common sense) to actually have Mei poisoned because that would get the other Zyurangers defenseless without the arrow. Mei learns to conquer her fears so she can help the others. After last week's fun clip show, it's time to go back to the main plot. Naga is now a dangerous creature with all his repressed emotions showing up. This episode also has the sideplot of going back to the past to discover what truly happened. It's about time that somebody from Naga's civilization shows up and her name is Echidna though you can tell she's also played by Naga's actor. According to Echidna, she must destroy Naga because he has gained emotions. They achieved peace at the cost of boredom. I guess there's an important lesson we have to learn in the next few episodes. We also discover that Balance had something to do with Naga starting to yearn to escape the boring existence of the Orphicius system. If I were Naga I would have wanted to escape that dull, boring existence and I don't think I'd do anything different than Balance.